How is it going with your t-shirt business? Great? Just good? Do you feel like maybe you could do better? You probably can! It’s time to take a close look at your SEO strategy. If you have no idea what we’re talking about then you’re in desperate need of this post. SEO optimization is the best way to get customers to your shop and increase your sales. Search Engine Optimization or SEO is how we built our shops, or websites in order to rank higher on search engines like Google or any platform we are selling t-shirts on. In order to sell more, we have to use keyword-rich descriptions and relevant tags. So let’s begin! So the first thing you want to consider is that this is a post for sellers that already have a t-shirt shop and brand. This is for t-shirt sellers that have done everything right but want to know how to sell more or how to promote their products more effectively. 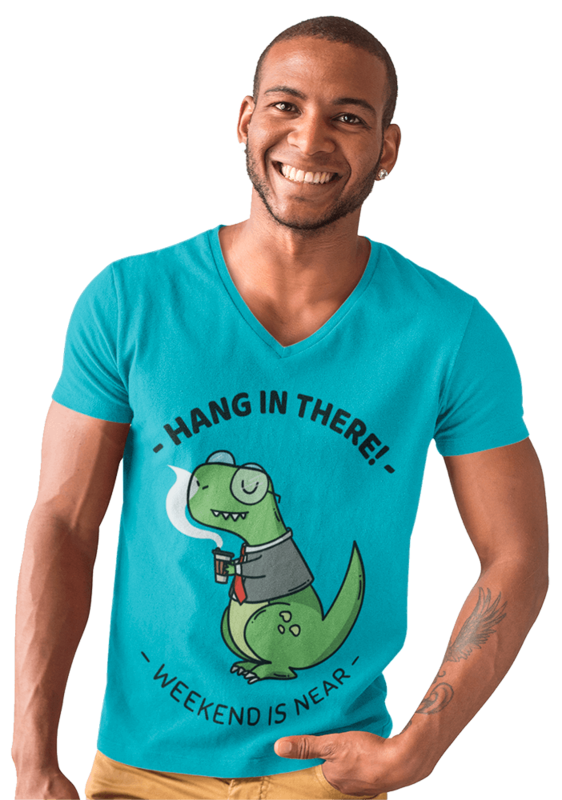 If you feel like you are not here yet, then I suggest starting with our How to start your t-shirt business first. As you keep trying, Google keeps suggesting until there is no longer a keyword. Also, consider your bottom suggestions for popular searches. There are tons of plugins, and websites you can use to search for your keywords and check their real-time ranking according to an area or time period. 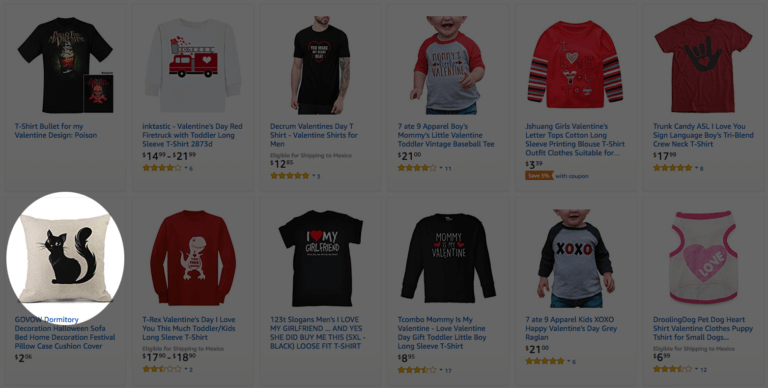 There is a difference between a t-shirt, t-shirts, shirt, and all of its variations, so you should always choose the keyword with a high ranking position that still describes exactly what you are selling. Try it! Look for different keywords and variations of the same product and you will most likely get different product results! Notice the difference in volume? That is what a simple “s” can change in your keywords. Variations are different ways to write the same word including its plural. Synonyms are keywords that mean the same thing but using a different word. Specifications are gender, season, design, style and everything else that may be used to describe your t-shirt. 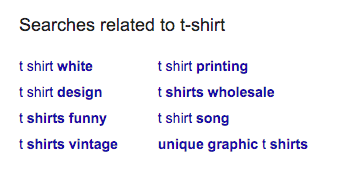 So according to this research you could name your product something like: “Dinosaur t shirt for men” to combine volumes. Try very specific naming and try general names too. You will definitely get different results. PRO TIP: Another fun way to discover new possible tags for your t-shirt business is doing some research on Pinterest boards. Pinterest is a very popular platform for trends and fashion and millions of users look for new clothing ideas every day. Try using different keywords for some of your products to test for a while. If that keyword is also delivering results, well there you go! Avoid being dismissive, it’s so very annoying when you are searching for a specific product and you get results that are not at all related. Like searching for a “Valentine’s t-shirt” and landing on a cat pillow which is probably using this keyword to hop on for that ride. Again, very annoying. SEO strategies may vary according to the website you are using to sell your t-shirts. For example, Etsy allows you to target keywords on titles and tags, while other descriptions just don’t rank at all. So the first step would be to consider the platform you are working with, they will all variate a little. Depending on the site you use, research a little on what are your SEO options for that specific page. Remember how Google autocompletes with the most possible text that would follow? Etsy does the same. 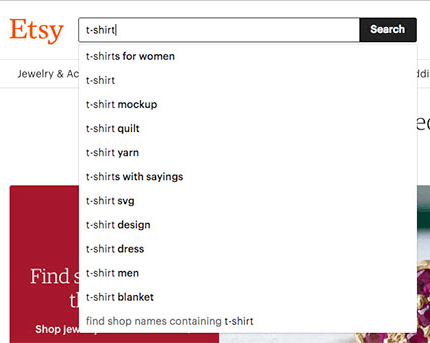 This way you also get a look at the most searched keywords on Etsy. Note that almost in all listings, usually the first four sites, shop, pages, will be paid campaigns. However, you can achieve first places with a proper keyword- accurate strategy and lots of promoting your shop anywhere that matters. Sometimes SEO takes a little to kick in so our advice is: if you are in a rush to get results then try paid advertising. You can visit our “How to Make Great Facebook T-shirt Ads and Boost Sales” to read more on making ads for paid campaigns. Get out there and see what your competitors are using and try to test that strategy on your shop too. Remember keywords are in constant change. Top keywords are a consequence of popular trends and searches, so every strategy that worked for you once, may not work anymore after a while. Test new keywords constantly in order to keep discovering new tricks. Another great way to use your keywords is naming your image file as descriptively as you can. So no “234987fkf.jpeg” but “Halloween t-shirt for girls in purple”. If you are downloading mockups from your browser, make sure your file names are correct. 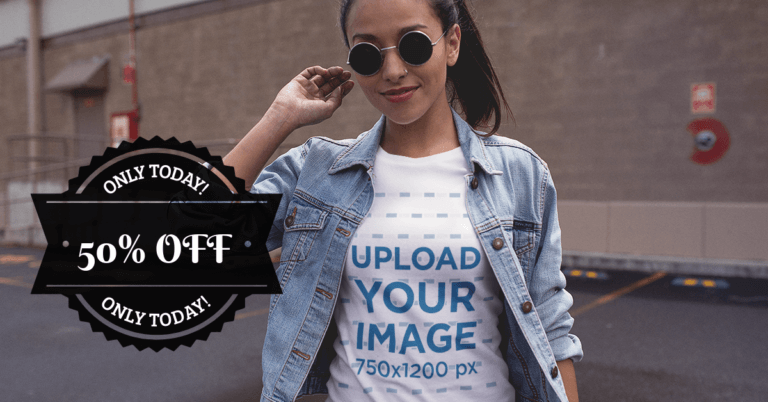 Placeit’s t-shirt mockups are SEO optimized for that specific image so you can keep whatever is keyword valuable and adjust to add your t-shirt keywords. For example, let’s say your keyword for a specific keyword is autumn t-shirt and you download “smiling girl in a t-shirt with flowers on the back” you can rename your image to say: “smiling girl in an autumn t-shirt with flowers on the back” or simplify it even more. So here it is, It’s not all about making beautiful designs, or choosing the most popular POD site to promote your t-shirts. Selling t-shirts is a business in which everyone has the facility to join. So you’ve got to get smart! 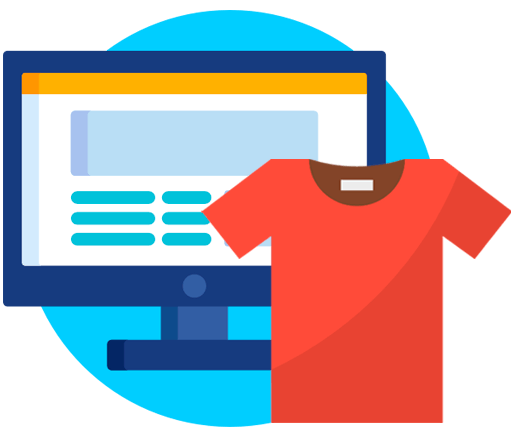 Take a close look at your SEO as a t-shirt business and jump a few steps ahead from the competition. Forget about hiring a designer to make professional designs for your t-shirts or spending hours trying to take a decent picture of your product. With a Placeit unlimited subscription you get unlimited access to all of Placeit’s professionally-designed assets and t-shirt mockups! "Very helpful information and great images from Placeit’s t-shirt mockups!"